During the decades following the opening of Grace School and Grace Church, the demographics of the neighborhood began to shift. As the Chicago suburbs grew, many members and supporters of both the church and school moved out of the city. More and more immigrants were moving to Chicago and many were settling in the community around the school. What had once been home to immigrants from Germany and Eastern Europe slowly became the new home of an increasing number of immigrants from Mexico and other countries throughout Latin America. By the 1970s, the neighborhood had changed from mostly German & European residents to mostly Mexican residents. The population of Mexican immigrants and second and third generation Mexican-Americans continued to grow into the 1990s. By the early 1990s, Grace Lutheran Church was struggling with an aging and declining Lutheran membership. Grace Lutheran School was struggling as well with declining enrollment as fewer Lutheran families were making their home in the neighborhood. 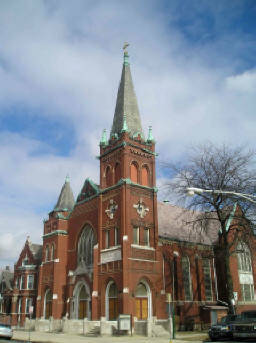 Although the church shared their building with La Santisima Trinidad, a Missouri Synod Lutheran Hispanic mission congregation, financial problems continued to increase for both the school and the church. Grace Lutheran Church realized it could no longer financially support the school. Without an alternative financial solution, the school would be closed down. At that time, Grace Lutheran Church approached the Northern Illinois District (NID) of the Lutheran Church Missouri Synod with a bold plan. They asked NID to take over operation of the school for three years. The goal would be for Grace to improve its enrollment and financial independence over those three years after which the school would take over its own operations. NID accepted the proposal and the plan was implemented in 1993. As agreed upon, for three years the District acted in place of Grace’s congregation providing both spiritual and monetary support to the school. By the end of the three years, enrollment had improved and Grace was ready to operate on its own. Today, Grace is an RSO (registered non-profit service organization). Grace is no longer under the leadership of the NID or Grace Lutheran Church, which also means it also no longer receives weekly financial support from the NID or a congregation. Instead, the school relies on tuition, fundraising, and the generous donations of friends and alumni to stay open. In 2010, the name “Grace Christian Academy” was adopted. While the new name helps Grace better connect with its neighbors, the mission remains the same as it was in 1896: Bring the good news of Jesus Christ to the children living in the Little Village neighborhood.